Flex A Seal Tanking Systems are designed to contain hydrostatic water pressure and are specifically installed to prevent water entry or egress. 1. Effective tanking installation where the foundation and retaining walls join. 2. The correct location of agricultural pipes in relation to the height of the retaining structure. 3. Using the right filtration material to fill in the trench between the retaining wall and the battered excavation, once the tanking installation is in place. Flex A Seal can assist in providing advice and contracting services to carry out anyone or all of the above works. Flex A Seal provides positive and negative tanking systems. 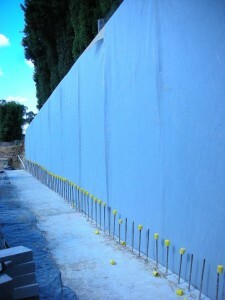 The later is often referred to as ‘retrofit systems’ and are applied to the inner side of the retaining walls. Our versatile range of tanking systems enables us to provide effective solutions where design criterion conforms to our safety and installation methodology. All our “external tanking systems” include the installation of a protective layer that prevents tanking membranes from possible damage during backfilling or certain drainage filtration installations. Flex A Seal’s specific multilayered tanking systems are fit for use as an exposed system or covered by cladding, cement render, or tiles. We only offer tanking systems that are inert, ensuring potable water will not be contaminated or discoloured. 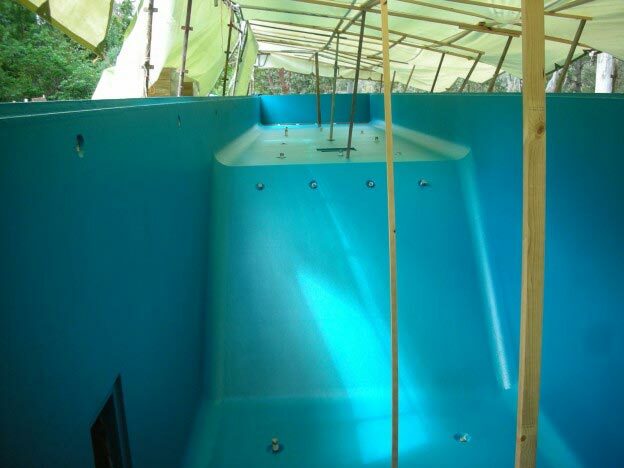 Our feature pond and swimming pool tanking systems can be finished in a variety of colours, most of which are UV stable. For reflection or organic ponds, however, we recommend black or black/green as the most suitable algae growth-retarding colour scheme. All of Flex A Seal’s tanking systems integrate well with commonly available proprietary wall renders and tile adhesives. Our meticulous installation techniques have resulted in many successful tanking installations that have been in service for well over twenty years. WE WANT TO BE PART OF YOUR NEXT PROJECT – CALL US TODAY.